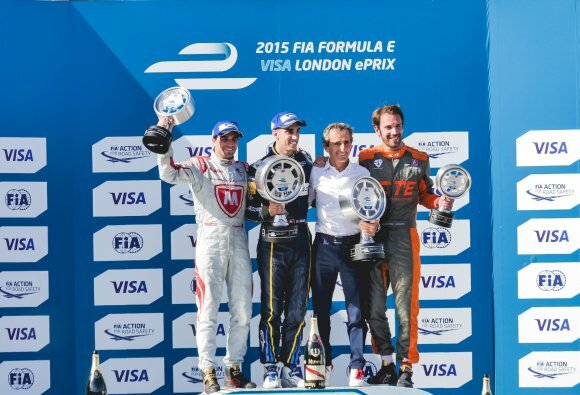 The inaugural FIA Formula E Championship concluded in style, with e.dams-Renault clinching the Teams’ title after Race 1 on Saturday, June 27, thanks to the lights-to-flag victory of pole-winner Sébastien Buemi. The Swiss driver’s points haul of 28 points closed the gap to leader Nelson Piquet Jr to just five units ahead of Sunday’s action. That boosted his confidence, which was lifted further when Buemi got a dry qualifying slot (Q2) for Race 2, while title rival Piquet was slowed by a heavy shower during Q3. The wet session shook up the start order for Race 2, with Stéphane Sarrazin (Venturi) claiming pole position and title challengers Buemi and Piquet starting from sixth and 16th places on the grid respectively. Forty minutes later, after one of the season’s most exciting contests, the Swiss driver and the Brazilian collected fifth and seventh places overall. That was enough for Piquet (144 points) to seal the Drivers’ crown by a single point. The race itself was won by Sam Bird (Virgin Racing), ahead of Jérôme D’Ambrosio who claimed his second strong result of the weekend. “These Michelin tyres have been amazing all season. The first time I saw them at Donington last summer, I thought they were rain tyres and that they would move around too much because of their tread pattern. When I tested them, I realised that Michelin had come up with something different to what I had ever experienced before. They delivered a very high level of performance and efficiency for these fast, innovative cars despite the weight of the batteries.